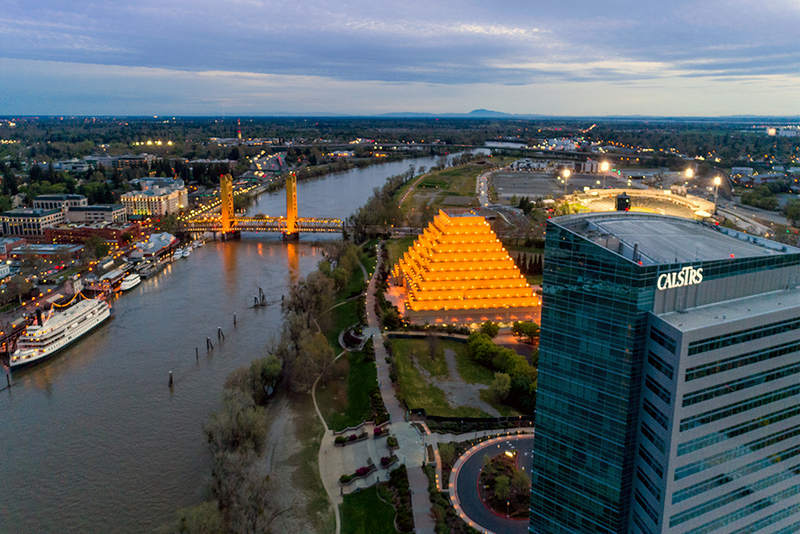 If you are looking for the leading aerial photographer in Sacramento, you have come to the right place at Coruscating Images. We capture stunning aerial views of our customers’ businesses, events, properties, and homes. Whether you are advertising real estate, a golf course, or the local event of the year, we can get you the images and videos you need with aerial drone photography. Whether you are looking for Aerial Real Estate Photography, Aerial Construction Photography or Commercial Aerial Photography, we have you covered. Coruscating Images is a Certified UAV Pilot in Sacramento, so rest assured you are in trustworthy hands. If you are looking for a company you can depend on to get the job done, give us a call. We are certified in all areas of drone photography and our pricing is competitive. Please give us a call today if you have any questions. Aerial photography is simply photography that is taken with a camera attached to a drone. Aerial Photography can be associated with professional cameras and small Cessna airplanes as well. If you are looking for commercial aerial photography from a plane, give us a call as we can arrange a shoot. Expect that you will pay more for a shoot of this nature as it is costly to get a Cessna in the air as opposed to a drone. Drones are unmanned aircraft’s in which we control the drone from the ground and fly it overhead to get the footage that you need. This will bring the cost of your aerial photography shoot down substantially. Why do you need aerial photography? Well, why do you need a tailored suit? It’s all about image. If you want people to be impressed, you have to impress them. And aerial photography is incredibly impressive. This technology makes it possible for us to get the sweeping vistas and panoramic videos that used to be only possible for the biggest Hollywood studios with the most massive budgets. Imagine clicking on a listing for a million dollar home and seeing a bunch of pixelated images taken on someone’s iPhone. Imagine clicking on a listing for another million dollar home and seeing a grand aerial view that shows the ocean view, the golf course that the house abuts, and the sweeping drive up to the front door. Imagine being able to click “play” on a video and getting an aerial tour of the place, soaring up over the roof and down along the pathways. Which one would make you pick up the phone and call the realtor? You might think that people have become desensitized to aerial photos and videos since they appear in practically every movie that hits the theaters. But in fact what has happened is that people have grown to expect it. One-half of the reason why you need aerial photography is that it will make your business, property, event, etc. look incredible. The other half of the reason why you need aerial photography is that you can’t afford not to. Your competitors are already using drone photography in their advertisements. Do you want to be the listing with the iPhone pictures or the listing with the sweeping aerial views? It’s up to you. When you call Coruscating Images for aerial photography, you aren’t just getting great photography skills. You are also getting a team with cutting-edge aerial photography equipment. This means you get the best video footage, the most high-resolution images, and the best overall results possible. We use the DJI Phantom 4, a state of the art photography drone, and 4K photo and video capabilities. The Phantom 4 is an amazing photography drone designed by DJI. It features precision hovering, tap to fly, visual tracking, sport mode, and extended flight time. It is lightweight while having minimum vibration, it can fly in multiple modes, it has a flight time of 28 minutes, and can fly up to 5 km. The Phantom 4 is designed to provide the smoothest, most beautiful flights possible for the best footage, and it delivers. 4K video and photo simply means that the camera takes photos and videos with high definition: 4,000 pixels across, to be exact. This is about four times as detailed as a standard computer screen resolution. This gives an extremely high-quality image and video. It looks amazing when posted at standard sizes, and when your viewers and customers decide to try zooming in on the pictures of your property, they will be able to see extremely high levels of detail as well as zoom in for an incredibly long distance before the image starts to get pixelated. If you are looking for the best in aerial photography, call the company with the best aerial photography equipment. Call Coruscating Images today! Contact Coruscating Images today to talk about your aerial photography project and to get a free estimate!